Virtualization provides the opportunity for organizations to utilize existing resources to create new and innovative ways to achieve higher availability, better reliability and an overall better user experience -- all while not breaking the bank. 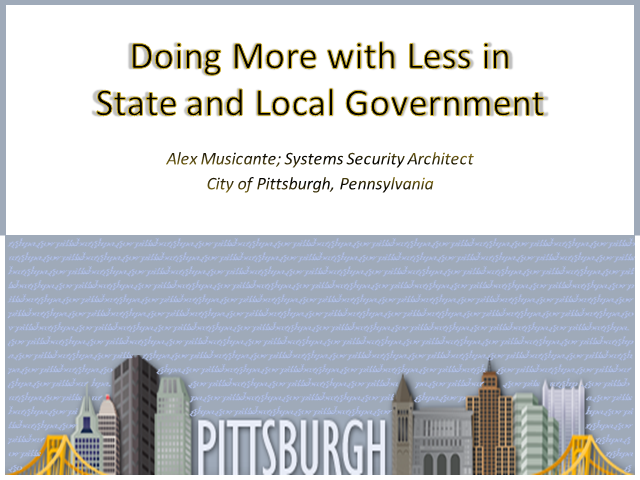 In this webinar, you will learn how Alex Musicante, System Security Architect, leveraged virtualization to improve the City of Pittsburgh's infrastructure, and explore his thoughts on the what the desktop market can and will bring in the future. •How an IoT pattern can be used in Azure IoT Hub using a presentation and references to real tenants. The COOP presentation will provide an understanding of Continuity and Continuity of Operations, explain the importance of a viable Continuity capability, and emphasize the need for a viable Continuity capability in all organizations. - Educate Federal, State, territorial, tribal, local government jurisdictions, private sector organizations, and emergency management practitioners on the importance of integrating Continuity into daily operations, functions, plans, and mission areas. - Emphasize the Federal Government’s Policy requiring Federal agencies to be prepared for unpredictable threats such as earthquakes, accidents, sabotage, and terrorism. - Discuss the importance for State, territorial, tribal, local government jurisdictions, private sector organizations to be prepared for unpredictable disruption of business operations. - Provide States, territories, tribes, local government jurisdictions, private sector organizations, and businesses with assistance, guidance, knowledge, networking, resources, and tools needed to succeed. Every day hundreds of Public Administration organizations roll out hundreds and thousands of new virtual desktops. Centrally managing desktops rather than hundreds of devices is appealing but the costs associated with data storage devices with enough horsepower to handle boot storms and virus scans can kill projects before they even get off the ground. Join Vince LaPaglia, Technical Marketing Engineer and VMware Certified Professional from NexGen to discuss new value-driven data management capabilities required to roll out cost effective VDI projects that deliver a superior end user experience. It is no surprise that government agencies face unique challenges as they try to improve efficiency and productivity by providing employees access to data anytime, anywhere on any device. •Can you provide all end users with services that deliver agile mission value? •Will you be able to leverage existing infrastructure investments? •What are realistic ROI expectations? •How do you establish a clear path to the future? Desktop-as-a-Service, also known as cloud-hosted desktops and hosted virtual desktops, provide a myriad benefits for organizations who want to scale rapidly: Fast & flexible, no CapEx, desktops hosted in data center nearest to you. End user computing can really drive down the total cost of ownership (TCO) -- if you take advantage of the virtual desktops. View this video to learn how Horizon 6 can optimize your application delivery and ease of management, while lowering the costs of virtual SAN to truly begin creating your own software-defined data center. End user computing solves many complex issues in today's fastest-growing industries: Healthcare, financial services, government, education, manufacturing and retail. In today's session, you'll learn about how VMware Horizon 6 address these industries' requirements using customized solutions to minimize risk for customers and accelerate time-to-value. Dr. Sasi Pillay, the CTO of NASA, will discuss how NASA is using big data from their thousands of missions they run every year as well as how big data has impacted their data center infrastructure. Vulnerabilities in software put at risk the Nation’s critical infrastructure. The risk is compounded by software size and complexity, the use of software produced by unvetted suppliers, and the interdependence of software systems. Software assurance deals with the root of the problem by improving software security. October 13, 2011 saw the release of the Securities and Exchange Commission's guidance on the reporting of material cyber security breaches. Consistent with regulations which address financial reporting, this guidance calls for publicly-traded companies to disclose breach information to current and prospective investors. Such disclosure may include discussion of service providers associated with the event. This session will summarize the disclosure guidance and discuss its implications to both the business and the incident response team. A collaboration model will be discussed wherein a business representative can work with the IR team to evaluate incident materiality, allowing the business to address this guidance efficiently. The implications of of the Dodd-Frank Act in light on this guidance will also be discussed. As an ITSM professional with over 30 years experience in IT, Mike will discuss the importance of collaboration and coordination among all work groups in the creation of a Service Catalog and share the challenges he faced as a Process Owner. Social engineering is the art of creating social illusions that result in the sharing of sensitive information or physical access to secured areas. This webinar will review the psychological framework that informs a social engineer's reconnaissance, pretext formulation, and social exploit activities. A case study will illustrate the use of the Social Engineer's Toolkit, Maltego, and Google Hacking to collect information that contributed to a successful engagement. Attendees will learn to identify social illusions and respond to protect their personal and professional data. They will also learn how to frustrate the efforts of social engineers. The National Institutes of Health (NIH) is a very large, multi-faceted organization with a significant IT presence. A ten year veteran of the IT customer support industry, Phil will discuss his organization’s challenges, trials and tribulations, and successes as they evolved from a Help Desk to an IT Service Management focused Service Desk. Phil’s presentation covers: the transformation of their very large internal organization – what was the “before” picture and how they determined what needed to change; how they articulated a vision and set objectives; the process of creating buy-in from skeptical IT service partners and customers in adopting the necessary ITIL processes – what worked and why; the process used to select and implement the right tools to support the objectives; steps taken to “cement” a service-based climate and a summary of major improvements made that radically changed IT support. This session will look at the use cases developed by the US National Institute of Standards and Technology (NIST) in collaboration with the public to drive interoperability, portability and security of cloud computing. A panel of key representatives from NIST as well as several industry standards organizations, including the DMTF, SNIA and the Cloud Security Alliance will discuss their work as it pertains to these use cases. The discussion will cover portable workloads and standardized interfaces for cloud computing. The goal of cloud standards is to improve cloud consumer agility and define a set of architectural semantics that unify the interoperable management of workloads and resources between enterprises of all sizes and cloud computing infrastructures. Organizations are faced with dwindling IT budgets and pressure to deliver more with less; sophisticated data centers can help meet this challenge. By embracing technologies such as virtualization, IT can deliver increased compute capacity, reduce its footprint and even enhance its green IT posture. Los Alamos National Laboratory has evolved its successful technology investment in virtualization into a self service Infrastructure-as-a-Service (IaaS) private cloud, providing compute resources on demand to users and bringing the cloud into our data center. The Marine Corps has had tremendous success in virtualizing IT infrastructure to improve utilization and availability while reducing the cost of hardware and manpower associated with managing servers. Desktop virtualization is the next logical step to continue this momentum. The Marine Corps is interested in reducing the touch labor costs with managing desktops, improving security, and providing disaster recovery. This presentation will focus on the vision and strategy, describe a notional desktop architecture with use cases and provide lessons learned from ongoing virtual desktop proof of concept deployments. The data center in LBNL’s Building 50, Room 1275 has a long and interesting history that stretches back several decades. The center originally housed large, air-cooled IBM computers. It was later reconfigured to support LBNLs’ payroll and other miscellaneous computing needs. In 1996, the National Energy Research Scientific Computing Center (NERSC) was located in this center that used water-cooled Cray C-90 computers. In 1999, the Cray computers were replaced with new air-cooled computers. By July of 2007, the data center had two types of datacom equipment: approximately 250kW of high density research computing clusters and approximately 90kW of “back-of-house” IT equipment. A baseline energy-use assessment, and subsequent energy-efficiency retrofit analyses, began in July 2007. This assessment confirmed a baseline IT load approximate of 330 kW. With a cooling system capacity of 140 tons (nominal), it only just kept the servers cool. However, during the assessment period while some retrofit measures were being installed, the facility operators added approximately 100 kW of IT load. To further complicate matters, the IT staff was contemplating installing an additional 120 kW of IT load in the near future that would bring the total connected IT load to 550 kW. Mr. Dale Sartor from the Lawrence Berkeley National Lab (LBNL) specializes in the energy efficiency of buildings for high-tech industries. He will describe trends and issues relative to energy consumption in data centers, and will focus his talk on lessons learned improving the efficiency of LBNL’s own data centers. LBNL has benchmarked dozens of data centers. The results of that benchmarking, as well as high level performances metrics and tools will be presented. Further benchmarking helps identify opportunities and best practices. The best practices adopted at LBNL will be described. Topics will include: air management, right sizing, plant optimization, liquid cooling, “free” cooling, humidity control, the electrical power chain, and design and operational practices. Finally Mr. Sartor will describe some of the resources available to improve energy efficiency in data centers. Tune into the webinars in this BrightTALK Channel for the latest best practices and analysis of information technology. The content is specifically created for public sector IT professionals and administrators.